The FRCOG staff is assisting the towns of Buckland, Montague and Whately to compile Complete Streets (CS) Prioritization Plans as part of the Massachusetts Complete Streets Funding Program. By completing a CS Prioritization Plan, Towns become eligible to apply for funding to construct the improvements that are identified in the Plan. Towns are eligible to apply for up to $400,000 per year for construction funding through the Massachusetts Complete Streets Funding Program. Towns are also able to apply for funding for planning assistance to compile their CS Prioritization Plan. For further information, please contact Senior Transportation Planner II, Elizabeth Giannini at Giannini@frcog.org. Below are links to Story Maps that show the projects identified in the Buckland, Montague and Whately plans. In 2017, FRCOG Staff assessed the demand for electric vehicle charging stations in the region with the goal of determining if the existing infrastructure is adequate or if additional charging stations are needed. The study found that existing public charging stations in Franklin County are well used and additional stations are needed throughout the region. The study and its findings can be found here. In 2018, FRCOG Staff evaluated the existing park and ride facilities in Franklin County to determine how well they are being utilized. In addition, FRCOG Staff conducted surveys of the park and ride facility users to better understand where they were coming from and how they were using the lots. The study shows that the use of the Whately and Sunderland park and ride lots continue to increase and that many users of the Sunderland lot are parking there in order to access public transit. For more information, please contact Senior Transportation and Land Use Planner, Megan Rhodes at mrhodes@frcog.org. Every four years the FRCOG updates the Franklin County Regional Transportation Plan (RTP). The RTP is a comprehensive accounting of transportation needs, issues, facilities, and potential funding needed for the regional transportation network over a 25-year time horizon. An update of the RTP is currently underway. For further information, please contact Senior Transportation and Land Use Planner, Megan Rhodes at mrhodes@frcog.org. The FRCOG staff prepared a Green Infrastructure Guide for Public Works Projects. The Guide introduces different green infrastructure storm-water management techniques and explains how the techniques could be applied in transportation projects. The Guide includes information on design and maintenance, benefits, limitations, and the costs for implementing different techniques. It also includes links to additional resources and funding sources. Case studies from the region are highlighted. For further information please contact Senior Land Use and Natural Resources Planner, Alyssa Larose at alarose@frcog.org. The reports of High Risk Stream Crossings in the Deerfield River Watershed are now available. The information in the reports and maps is from a pilot project completed by the Massachusetts Department of Transportation (MassDOT) and the University of Massachusetts, Amherst (UMass) that assessed the vulnerability of road-stream crossings to precipitation events. FRCOG planning staff compiled this information for each Franklin County town within the watershed as part of the FY18 Franklin Region Unified Planning Work Program. The purpose of the maps and reports are to help municipal officials and public works staff prioritize bridge and culvert upgrades in their town. The reports also provide information on how to make road-stream upgrades more resilient to current and projected precipitation conditions, and lists potential funding sources for upgrading crossings. The town reports are available here. The Most Hazardous Intersections in Franklin County, 2011-2013, reports on data from motor vehicle crashes in Franklin County and identifies locations with repeated crash occurrences. Trends in the factors contributing to crashes were examined, and the most hazardous intersections in Franklin County are ranked. The report includes an overview of the Top Five Most Hazardous Intersections in Franklin County. For further information, please contact Transportation Planning Engineer, Laurie Scarbrough at lscarbrough@frcog.org. The FRCOG completed a series of three Alternative Transportation Maps. Maps for Greenfield/Turners Falls, Shelburne Falls, and Orange were created. The maps provide information on the location of bus routes, bus stops, the Franklin County Bikeway, sidewalks, and popular destinations such as parks, schools, and libraries. The maps also include tips and helpful resource information when taking the bus, walking and bicycling. The maps were mailed to households in downtown Greenfield, Turners Falls, Shelburne Falls, and downtown Orange, with the goal of increasing mode shift to alternative transportation. For further information, please contact Senior Land Use Planner, Alyssa Larose at alarose@frcog.org. Complete streets are roadways that have safe access for all users including pedestrians, bicyclists, motorists and transit riders. As part of an effort to promote Complete Streets and safe transportation access for all roadway users, the FRCOG staff compiled Complete Streets Projects in 2012 and 2014 which analyzed a total of 15 locations to assess and recommend complete streets improvements. A link to the 2012 report is here and a link to the 2014 report is here. 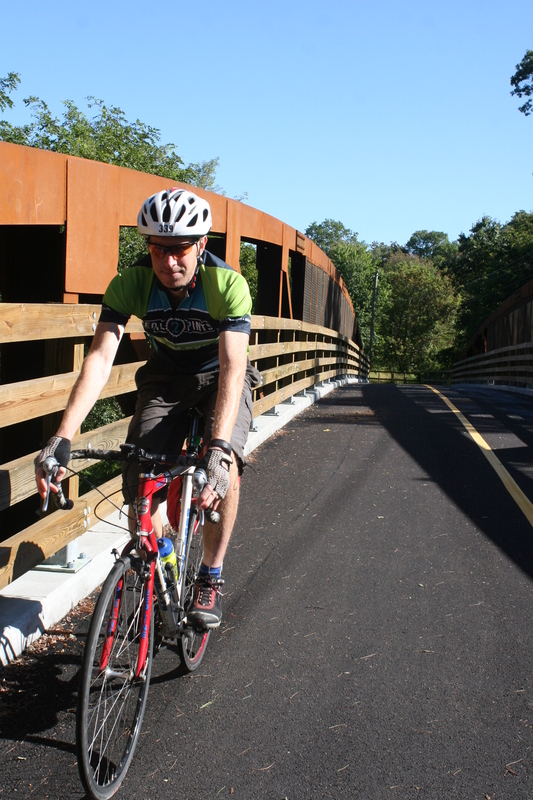 The FRCOG has coordinated to create a bicycling map for the tri-state (Massachusetts, Vermont, and New Hampshire) section of the Connecticut River Scenic Byway area. The FRCOG worked with the Pioneer Valley Planning Commission (PVPC), Windham Regional Commission (Vermont), and the Southwest Regional Planning Commission (New Hampshire) to develop a print and an online bicycle facility map. A pdf of the print map can be viewed at Connecticut River Byway Bike Map. The project also includes the installation of some wayfinding signs to aid in navigation along the recommended bicycle routes and also the purchase of bicycle parking racks at some key visitor-oriented locations in the Hampshire County section of the Byway. The intention of the project is to enhance the bicycling resources in the tri-state area of the Connecticut River Scenic Byway. The project has presented a unique and welcomed opportunity for the Massachusetts based regional planning agencies to coordinate and work with their counterparts in New Hampshire and Vermont. The project is intended to build on a growing tourism industry sector – bicycle touring. For further information, please contact Megan Rhodes at mrhodes@frcog.org. The Franklin County Bikeway is a county-wide regional bicycle network. The Bikeway consists of both shared roadway routes and off-road bicycle paths. The original 44-mile section of the Franklin County Bikeway is centered along the Connecticut River Valley and marked with a wayfinding sign system. In 2009 an update of the Franklin County Bikeway Plan was completed which defined routes to expand the Bikeway to cover the entire county and also to connect to the bordering counties and states. Wayfinding signs have not yet been installed on these expanded routes, but the entire county-wide network (approximately 240 miles) is included in the Franklin County Bike Maps. There are plans to also install Franklin County Bikeway wayfinding signs on the routes that are not signed already, generally those in the east and west county area. The FRCOG is working to identify locations for the signs. For further information on the Franklin County Bikeway please contact Senior Transportation Planner II, Elizabeth Giannini at giannini@frcog.org. In 2017, the FRCOG completed a bicycle parking purchase program. The FRCOG was excited to provide bicycle parking racks to communities in Franklin County free of charge. Through this project, the FRCOG provided 54 bike racks to 11 towns and 3 school districts (including Greenfield Community College). In collaboration with the Greenfield YMCA, the FRCOG developed Walk Franklin County maps for all of the towns in Franklin County. The maps depict one or two-mile walking routes in historic districts and town centers throughout the County. There are 28 maps and the routes include points of interest. In 2018, the FRCOG updated all of the maps as part of the Franklin County Mass in Motion Program. link to Walk Franklin County Maps. The National Scenic Byway Program is a federal transportation program which recognizes and celebrates scenic roads throughout the country. In Massachusetts, eligible roads are officially designated as Scenic Byways through an act of the Legislature. There are five state-designated Scenic Byways in Franklin County, the Mohawk Trail (Route 2), Route 112, Route 116, and Route 122. Additionally, there is one nationally designated Scenic Byway, the Connecticut River Byway (Route 63 and 47) in Franklin County. Each of the Byways has its own unique character and story which are highlighted on http://www.bywayswestmass.com, a website launched to provide information on the Byways of western Massachusetts. For further information please contact Senior Transportation Planner II, Elizabeth Giannini at giannini@frcog.org. Link Federal Scenic Byway Program website http://www.fhwa.dot.gov/byways/. With funding awarded through the National Scenic Byway Program, the Scenic Byway Land Protection Project allows the FRCOG funding to work on permanently protecting important scenic, natural and agricultural landscapes along the Scenic Byways in Franklin County. The project is being completed as a cooperative effort working with the Franklin Land Trust, the Massachusetts Department of Transportation, Massachusetts Department of Conservation and Recreation (DCR), Massachusetts Department of Agriculture (DAR) and the Massachusetts Department of Fish and Game. At the inception of the project, this cooperative effort was defined in an unprecedented Memorandum of Understanding that was crafted and executed between MassDOT, DCR, DAR, FRCOG and the Franklin Land Trust. To date, a total of 915 acres of landscapes critical to the Mohawk Trail, Connecticut River, and Route 112 Scenic Byways have been permanently protected. The FRCOG and the Berkshire Regional Planning Commission (BRPC) completed the Mohawk Trail Historic Preservation Project to encourage the preservation of historic properties on the Mohawk Trail Scenic Byway. The project had two components: 1) to prepare Historical Survey Forms and/or National Register of Historic Places nomination forms for several properties along the Mohawk Trail Scenic Byway, and 2) to conduct a study to determine the feasibility of developing and administering a revolving loan fund to assist landowners of historically significant properties on the Mohawk Trail. For further information please contact Senior Transportation Planner II, Elizabeth Giannini at giannini@frcog.org. The Route 116 Scenic Byway was designated as a Scenic Byway by the Massachusetts Legislature on August 4, 2008. In Franklin County, the Byway travels through the towns of Deerfield, Conway, and Ashfield. It is a scenic drive through rolling farm fields and forested areas into the Berkshire Hills. A Corridor Management Plan was recently completed for the Byway. The plan was a joint effort of the FRCOG, Berkshire Regional Planning Commission, and the Pioneer Valley Planning Commission. The Route 116 Corridor Management Plan can be viewed here. For further information please contact Senior Transportation Planner II, Elizabeth Giannini at giannini@frcog.org. The Connecticut River Scenic Byway is both a Federal and State designated Scenic Byway. It is the only federally designated Scenic Byway in Massachusetts. In Franklin County, the Byway travels on Routes 63 and 47 in the towns of Northfield, Erving, Montague, and Sunderland. The Byway travels through the heart of the Connecticut River Valley and the neighboring farmland, floodplains, and historic villages. An updated Corridor Management Plan was completed in 2016. The FRCOG partnered with the FRTA on their Comprehensive Service Analysis (CSA) in 2014, which examined their fixed route services and recommended phased improvements. The FRCOG helped the FRTA with a series of public forums, called Community Conversations that were held around the region. The FRCOG completed an update to the region’s Coordinated Public Transit-Human Services Transportation Plan (CHST). This plan, in coordination with other transportation service providers in the region, assesses the transportation needs of persons with disabilities and seniors within Franklin County. Also, a video on how to load your bike on the bus is posted here. For further information on transit planning at the FRCOG, contact Megan Rhodes at mrhodes@frcog.org. The FRCOG has operated and maintained traffic counting equipment since 1991, primarily for the purpose of conducting state-requested counts required by our contract with MassDOT. However, fulfilling this obligation has taken only a portion of the traffic counting season, making it possible for us to use the equipment to conduct local traffic counts at no charge to our communities and support ongoing planning studies. The FRCOG operates automatic traffic recorders which have the capability to collect vehicle classification and speed data at most locations. The count season typically runs between May and October. The results of the counts uploaded to the MassDOT traffic counting master database that can be accessed at any time by visiting this link: http://mhd.ms2soft.com/tcds/tsearch.asp?loc=Mhd&mod= Traffic count requests can be made in writing (mail, fax or email) to Laurie Scarbrough, Transportation Planning Engineer at lscarbrough@frcog.org. Roadways are critical assets in the local and regional transportation network. They provide a connection between people, goods, and businesses. The condition of the roadways directly impacts the safety and efficiency of the transportation network. Therefore, it is critical that the condition of the roadways is examined routinely and long-term planning is conducted for the maintenance. A Pavement Management System (PMS) is a planning tool that collects and monitors information on current pavement conditions, evaluates and prioritizes alternative maintenance, rehabilitation, and reconstruction (repair) strategies. To complete Pavement Management System analysis FRCOG inspects all paved Federal Aid roadways that are under Town jurisdiction in Franklin County, on a three-year rotating schedule. Roadways are automatically surveyed and reports are shared with the Towns as they become available. Roadways falling under Town jurisdiction are those roadways for which the Town is responsible for its repair and maintenance. For further information please contact Laurie Scarbrough, Transportation Planning Engineer at lscarbrough@frcog.org. Through its function as a State Data Center affiliate, the FRCOG is able to provide statistical information upon request to residents, organizations, businesses, and municipalities in Franklin County. The staff has expertise in finding and analyzing data on a variety of topics, including demographic, economic, housing, transportation and local government. Commonly referenced data sources include the U.S. Census Bureau’s American FactFinder, the Commonwealth of Massachusetts’ Labor Market Information, and the UMass Donahue Institute’s Massachusetts State Data Center. Staff complete data requests free of charge unless the request requires a significant amount of data collection and analysis. The data requested is most often used to produce local and regional planning documents, write grant applications, conduct research, or develop business plans. To facilitate greater access to important data, FRCOG is participating in a partnership with other Pioneer Valley-based organizations to create an online resource. As this project progresses, additional information will be posted. To submit a data request or for more information about this service, please contact Senior Economic Development Planner Jessica Atwood at jatwood@frcog.org or 413-774-3167 x123. The investment of nearly $125 million dollars from the Federal Railroad Administration beginning in 2010 has led to the upgrade of the Connecticut River Main Line railroads tracks (roughly paralleling Interstate 91), the construction of three new passenger rail stops in Greenfield, Northampton, and Holyoke, and the relocation of Amtrak service back to those communities with the new stops. Known as The Knowledge Corridor, Amtrak currently operates its “Vermonter” service one round trip per day between St. Albans, VT and Washington D.C. on the new tracks. The southbound train arrives in Greenfield (at the home of the FRTA and FRCOG offices at the John W. Olver Transit Center) at approximately 1:45 p.m., returning northbound at 4:30 pm. Work is currently underway planning for expansion of service on these tracks for additional round trips per day between Greenfield and Springfield. It is hoped that this expansion will dovetail with additional rail increases to our south, as Connecticut and Springfield look to launch up to 17 additional round trips per day between New Haven and Springfield starting in 2018. The FRCOG has created a flyer with general information about the Greenfield Station platform and public overnight parking. The FRCOG also completed a study in September 2017 that explored how to attract more visitors to the region by passenger rail (link to Visitor By Rail_study). The FRCOG will be working with tourism organizations to implement the recommendations of the study. The FRCOG is also participating in work to expand Amtrak service from Boston to New Haven, and Boston to Montreal, both via Springfield. Known as the Northern New England Intercity Rail Initiative, this service will utilize the new Knowledge Corridor tracks for the north-south aspects of these trips, while the Inland Route tracks between Boston and Springfield will support the east-west leg. Final recommendations have been compiled, and work continues to solidify details and secure funding for equipment and operation start-up. More information can be found at http://www.massdot.state.ma.us/northernnewenglandrail/Documents.aspx. The Transportation Improvement Program (TIP) is a prioritized, multi-year program for the implementation of transportation improvement projects in the Franklin region. Any project intended to receive federal transportation funds must, by federal regulation, be listed in an improvement program that includes broad public participation. The TIP is drafted each year and includes detailed project evaluations that take into account need, community support, additional benefits, project readiness, and funding availability. The TIP is an expression of intent to implement the listed projects. A final commitment of funds for each of the projects has not been issued. The FRCOG planning staff works closely with the MassDOT Office of Transportation Planning (OTP), the MassDOT Highway Districts 1 and 2, and the Franklin County Transportation Planning Organization (FCTPO) to ensure that these prioritized TIP projects are advertised and funded. Projects on the TIP were solicited from Franklin County municipal officials, MassDOT Highway Districts 1 and 2, the Franklin Regional Transit Authority, and the Franklin Regional Planning Board. Please contact Maureen Mullaney at mmullaney@frcog.org or 413-774-3167 x 129 if you have any questions about the TIP. The Unified Planning Work Program (UPWP) describes the scope and estimates the cost of work tasks to be conducted by the transportation planning staff of the Franklin Regional Council of Governments (FRCOG) on behalf of the Franklin County Transportation Planning Organization (FCTPO) for a single fiscal year contract year. The UPWP outlines the region’s long and short-range transportation planning objectives and describes how these objectives will be met. The UPWP was developed to reflect State and Federal requirements, as well as local priorities and needs. Specific tasks are identified through the analyses conducted and recommendations generated from 2000, 2003, 2007, 2012, and 2016 Regional Transportation Plans. Tasks within the UPWP are also a response to previous work and input from the FCTPO and the Franklin Regional Planning Board. The 2018 UPWP (October 1, 2017, through September 30, 2018) was endorsed by the Franklin County TPO on May 23, 2017. The 2019 UPWP (October 1, 2018, through September 30, 2018) was endorsed by the Franklin County TPO on May 22, 2018. Reports of High Risk Stream Crossings in the Deerfield River Watershed are now available. FRCOG Wants to Hear Your Thoughts on Transportation in the Region!